I recently ran a column on the subject of teenage vandals on Halloween. What I didn’t mention – and I confess it’s been haunting me a bit – is that I have a brief history of teenager criminal behavior myself. I think it would be classified as Grand Theft Fruit and I’m not entirely sure that the statute of limitations is up. As teenagers go, I was a good kid. A 16-year-old public high school senior when this event occurred, I was editor of the school paper and president of the school’s service organization. In earlier years I had been Secretary of the Organ Club (music, not donors). So, I just want to say, Your Honor, that I wasn’t exactly going around breaking car windows on Halloween like some of the miscreants in my own neighborhood. The school service organization had decided the year before that as their major service project, they would adopt a Korean orphan which had a financial commitment of $10 a month – a significant sum at the time. We were clear that if we failed to raise this money, our orphan would starve. In the fall of 1964 when I was at the helm of this organization, we realized that due to orphan payments over the summer when we had no revenue, we would be short for our November 1 payment. Asking parents to fund this shortfall would never have been considered; it was our responsibility. 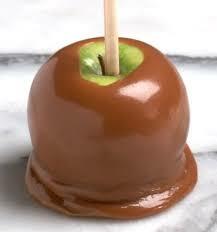 The club decided to raise money by selling caramel apples door to door. Caramels were fortunately on sale but we’d never be able to make the required profit if we had to buy apples as well. Came a voice from the back of our planning meeting: “What about Rockefeller’s apple orchards? He’s got plenty.” We all lit up. It was like a bolt of lightning from a sociopathic higher being. A little ways down the road from my New York City commuter burb was Pocantico Hills, the site of the Rockefeller estate. On many occasions, we had driven past his apple orchards. And yes, he did have plenty. So, is Your Honor asking if we knew that what we were doing was wrong? Well, the fact that we went at dusk might suggest so. With me driving my father’s car, five of us, clad in dark clothing, parked alongside the road, and, baskets in hand, crept stealthily up the hill. Two of us climbed the trees and shook down apples while the other three loaded them into the baskets. In my memory, we heard a shot. Like from a gun. But what we definitely heard was shouting in our direction and persons of a guard persuasion running in our direction. Terrified, we jumped out of the trees, grabbed the baskets and tore down the hill, hurling the apples into the trunk and blasting out of there at excessive speed, me driving the getaway car. For the next three days, I fully expected the police at our door ready to arrest Dad for being an accessory to a felony fruit heist. But opportunities to wield the poor judgment of our not-yet-mature frontal cortexes were not over. The next morning our club convened at the home of another member to make the caramel apples. As we unloaded the apples from the trunk, a terrible reality hit us that we weren’t aware of earlier given the dim light of early evening. It was the very end of the apple season and while these apples weren’t flat-out rotten, their best days were well behind them. We stood in the kitchen in silence looking at this sad collection of semi-decaying fruit and pondering our next move when someone said, “Well, we’re going to cover them with caramel, right?” The God of Frontal Lobe Deficiency was working overtime that day. I would like to say in my defense, Your Honor, that if we saw an actual worm in the apple, we didn’t cover it in caramel. Even we had some (very very minimal) standards. And so, we set to work, washing (yes, we did wash them first) and dipping our apples in melted caramel, and then meting out an equal number to each club member to sell in her neighborhood. Instructions were clear: Make the sale and move on. Quickly. Remember: it’s for the orphan. We did indeed make enough money to cover our orphan for the month. At our next club meeting, when our faculty advisor learned how these funds had been raised, the color drained out of her face. So, creepy Halloween miscreants, you’re still not forgiven for vandalism in my neighborhood. But in my heart of hearts, I know your type. So while it's true that the people make an event (and the people definitely made any event!) this space definitely adds a different dimension to it. Went to LA venues here for an evening event and I was really impressed.